Pojaman Shinawatra, the wife of ousted Thai Prime Minister Thaksin Shinawatra, went on trial Monday on charges of tax evasion, in the first corruption-related case to be prosecuted against the former PM's friends and family. 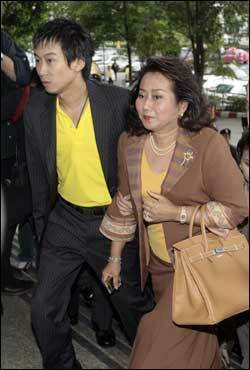 Pojaman, her brother and her secretary are being tried on charges of evading millions of baht in taxes related to a 1997 transfer of shares in the family-owned Shin Corp. Pojaman could face 14 years in prison if convicted. All three have pleaded innocent. The case relates to a 1997 transfer of shares in Shinawatra Computer, the company that later became the family's telecommunications empire, which was sold last year to a Singapore's Temasek for US$2.2 billion. Investigators for the Assets Examination Committee claim that Pojaman and her brother misrepresented the nature of the share purchase to avoid paying taxes.